The book needs an historiographic introduction, because it combines at least five cultural moments: 1969, the date of Schefer's first book, which was reviewed by Roland Barthes; 1976, the date of The Deluge; 1995, the date of the English translation; and 2014, the year I drafted this. Each has its own theoretical and historical concerns, and a full account should probably be an historiographic review. Here I would like to concentrate on the writing, as it appears—as it is legible—in the current moment. Let me propose five ways of reading what happens in The Deluge. In a brief, evocative Foreword to the English translation of Schefer’s double book on Uccello, Stephen Bann notes that Roland Barthes understood Schefer’s first book as a "decisive new tendency in the development of semiology," away from the idea of pictures as codes, and toward the notion that a picture is "a work of coding, not the depository of a system but a way of generating systems." Barthes's take comes from his own experiments with semiotics, including his early systematizing efforts, and his awareness of their limitations. He was open, even then, to a reverse movement of semiotics, one that developed almost twenty years later into books like Camera Lucida. Second, Bann also follows Barthes in proposing Schefer's work is a hapax, a word that occurs only once in a linguistic corpus. Hapax or hapax legomenon is a word sometimes used by classicists to name a word whose meaning can never be known because the language—one recorded in cuneiform, for example—is known only in a limited number of texts, so that it is not possible to compare contexts to locate its meaning. In Saussure's terms, there are no oppositional grammatical structures that can lend it meaning, so it remains unique and opaque. The Deluge is a "a text without redundancy," a unique instance. Schefer supports this reading in various ways, for example by saying bodies in the painting work as anacoluthons (sentence fragments), or by proposing that iconography can't be appropriate because figuration in the painting "does not add up" (pp. 27, 30). At the very end of his book he provided Barthes with his theme by saying a painting is a hapax, "a text without redundancy" (p. 54). Bann has also compared Schefer's project with one of Peirce's semeiotic categories. He mentioned this to me sometime around 2007, so I may be misremembering, but I think the category he proposed was the sinsign, which stands in Peirce's system for "an actual singular thing, an actual occurrence or fact." The more precise denomination would be "rhematic iconic sinsign," but the lexicon doesn't matter as much as the idea, which is that Schefer's text would be a unique object, responding, in an untranslatable fashion, to another unique object. 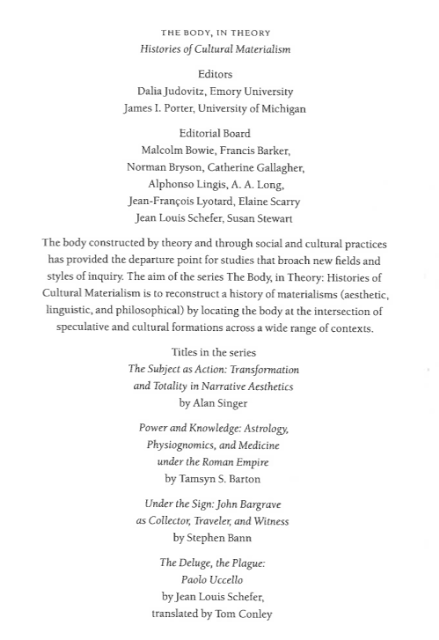 The context of the English translation is a book series published by the University of Michigan Press in the mid 1990s, called The Body, In Theory. The editorial board included Bann, Norman Bryson, Alphonso Lingis, Lyotard, Elaine Scarry, Susan Stewart, and Schefer himself. In that context, The Deluge belongs with the turn to theorization of the body in North American art history and theory, a turn that includes Scarry's book The Body in Pain and the Zone Press Fragments for a History of the Human Body (1989), books by Rosalind Krauss and Hal Foster, and, a bit late, my own Pictures of the Body (1999). 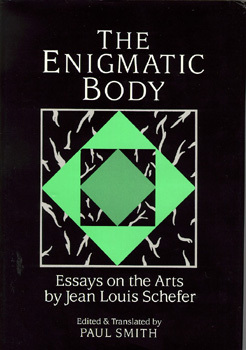 Schefer himself speaks of the body in the opening sections of his book: paintings are like bodies, he says, because figuration "posits the enigma of an inhumation of the intelligible body; of something that must, but cannot, be understood as such." 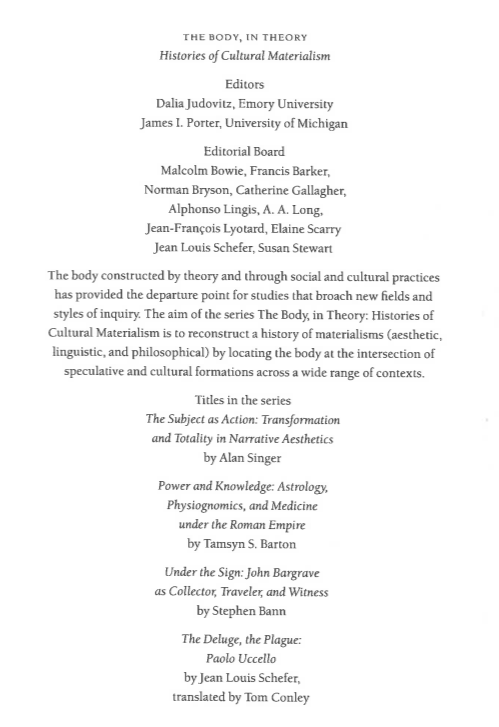 (p. 26) The body, in this book, is not only the "disaggregated" bodies of the painting, but the sense of figuration itself: an idea that surfaces also in Lyotard and Lacan, both of whom are alluded to in the opening two pages of the book. From my point of view, it matters most that Schefer himself frames his entire enterprise as a project of writing. 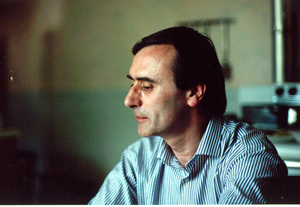 At the time of the English translation, Paul Smith, the English translator, interviewed Schefer; the text is in Artforum (1997) and also online. Schefer says Barthes's work is "marked by a way of perceiving problems which is ultimately just a style of writing." Under Barthes's influence, Schefer says, he "rather quickly opted for a quite personal way of working… I soon understood (or decided) that my 'literature' would consist in roaming among historical or cultural objects—that I'd be a writer without a novel." In The Deluge, at the end of his introductory section, he says "to write about painting is therefore, first of all, to write" (p. 32). Part of what this means is exactly what I imagine Barthes thinking of Camera Lucida: "writing," Schefer concludes, "is never either entirely protected from nor assured of not disappearing" into the "void of meaning" that the painting proposes (p. 33). This expanded sense of writing is the best fit, and I think the broadest context, for this project, so perhaps the time has come to revisit the idea that seemed most foundational to Barthes back in 1969. It would be possible to multiply this list: a sixth key to reading, I suppose, would be the religious themes Tom Conley explores in his Introduction to the English edition. Lacan is another possibility: he is alluded to very obscurely in the second paragraph of the book. But these five are enough to articulate the issues of writing I want to explore. In what ways is this book experimental, given its starting points in philosophy? By this I mean that it can seem to be enough to say that Schefer thinks about Lacan, Lyotard, Barthes, Bataille, and a dozen others at a certain point in the 1970s in France, and that is enough to make the book experimental—but if that context is taken as given, then in what senses is Schefer's text moving into places it does not recognize? One, I think, is simply the movement away from art history. At a distance of nearly forty years, that move appears at once uninteresting (because it has been done many different ways since then, including in books by Schefer himself) and very problematic (because the general corpus of French poststructuralist writing on art remains awkwardly detached from much of disciplinary art history, theory, and criticism). 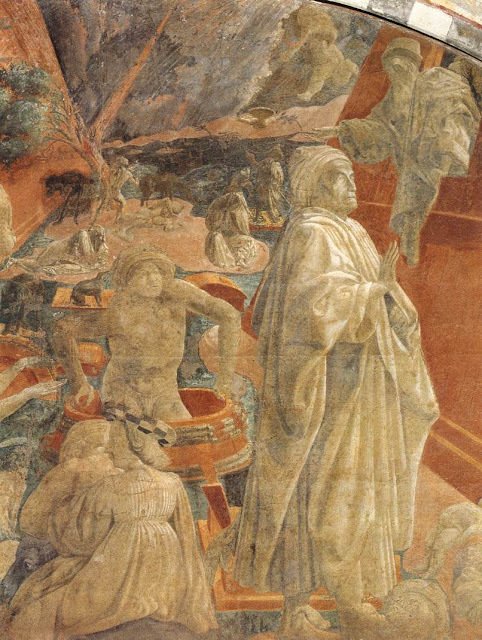 When Schefer writes that "it might be wise to note the importance of Uccello's place in the history of painting," and then immediately adds that "history has to be written in respect to the text that we are reading and only at the point where we are reading it," he makes a disavowal of historical sense more stringent than Keith Moxey's doubts in Visual Time (2013). But when he goes on to say that history "is disengaged, torn away, adrift," he is back in the more comforting domain of interpretation: the painting itself shows this fragmented sense of history, and so it can speak of it to a writer and reader who still imagine themselves to be in history (p. 39). Several of Schefer's recurrent themes, including color, texture, figure, and perspective, have more and less experimental moments, as he tries to compel his writing not to repeat familiar forms of interpretation, from formal analysis and semiotics to iconography. "Figures of writing," for example, may be "floating, drowning, veneering," or "sinking," but they are also classifiable. Even clouds—the subject of Hubert Damisch's 1972 book, which Schefer would have known—can be classified ("clouds of color, heimatikè néphélè [Aristotle], a fog of color," p. 46). This movement from radical, nearly illegible rewriting of meaning, and back to observations made by a particular viewer at a specifiable time, repeats itself in many ways, and I think its oscillation provides the book's most interesting structure. The pendulum swings from obdurate hapax to plausible interpretation all repeat the fundamental swing from art history to writing and back, and often the writer's voice is at its most concerted when the pendulum is threatening to swing back. 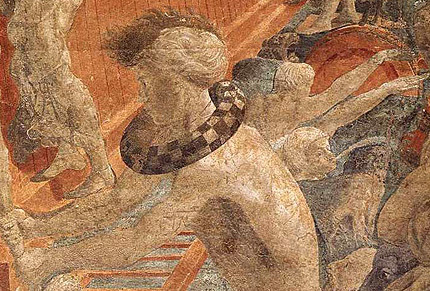 The mazzocchio, the strange checkerboard torus that two figures wear (and other emerges holds onto, in its guise as a barrel) is a hapax in the history of perspective. 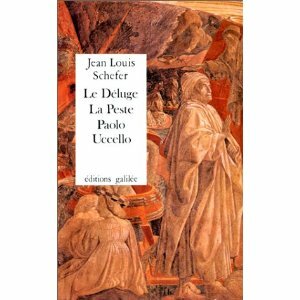 I wrote on it in my own first book, on linear perspective, because it is known that Uccello made a special study of it. It was a frame for a hat, but from a painter's point of view it was a supremely difficult exercise in perspective. Studies of the mazzocchio itself were a stock in trade of art historians from the late 19th century to the first decades of the 20th. Schefer doesn't bother to explain that, which means his book was aimed in part at art historians—although it is difficult to imagine how he thought it might be received by scholars for whom the mazzocchio was exclusively a vehicle to demonstrate the artist's perspectival skill. Schefer works especially hard at re-imagining the mazzocchio: it is part of the repertoire of the demonstration of the failure of realism; it is a sign of the ruin of the system of figural painting; at the same time "it is the only thing that might be apprised in the painting" (pp. 48-9, 92). It is, therefore, close to a key to Schefer's principal theme, the uniqueness of the encounter of writing and painting and the ways they ruin one another. But, as with Krauss's version of Lyotard's "pulse," Schefer does not want to let the mazzocchio work in such a way as to produce enlightenment: he doesn't want to let it produce itself as a theme, and so he reworks his account, multiplying, erasing, effacing what he has to say. In my reading, the pages on the mazzocchio are the most determinedly experimental. Is there a place between art history and the hapax? Is there, then, a nameable position between art history (by which I mean, in this case, any writing that can be read as a reference to history, to objects made in and for some past) and experimental writing (which denotes, in this case, writing that wants to insist on the imminent mutual destruction of meaning in the encounter of writing and painting)? I don't think so. In a crucial section toward the end of The Deluge, Schefer says that "what makes up some of the painting" is the fact that "only its complexity can be understood… and not its meaning." Meaning, which seems to play in the representation, is "not just an instant summation of the discourse behind the figures, but a summoning of language placed in a scene of impossibly specific writing" (p. 55). From this position, it is possible to name the objects of attention: figure, color, fresco, mazzocchio, language, writing. But it is not possible to keep them in sight for very long, because the flood of opaque water, the color of urine and feces, keeps covering them (p. 36). This is where experimental writing becomes poetry whose only remaining theme is its own necessary senselessness.